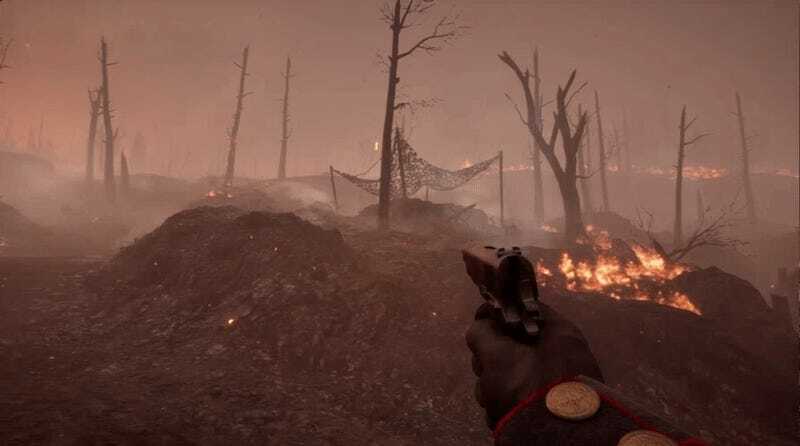 Battlefield 1's newest DLC They Shall Not Pass adds one of the largest battles from World War One: the Battle of Verdun. But how does this depiction compare to reality? The Battle of Verdun was a massive clash between France and Germany. The German goal was to choose a strategic target of such importance that it would force the French to commit a majority of their forces to a battle of attrition that would slowly bleed them dry. The French persevered but the cost was high. Lasting from February 21st to December 18th 1916, it claimed an estimated 714,231 lives. The Germans fielded 1,201 artillery guns at Verdun, many of which were heavy or ‘super-heavy’ artillery. French artillery included 388 field guns and 244 heavy guns. Rate of fire was high and trains supplied a heavy stream of rounds to the battlefield. The result was a heavily bombarded field set ablaze. Battlefield 1 doubles down on that image. As well as it should; the devastation of Verdun is a terrible and awesome thing to see. Battlefield 1 is a curious piece of work when examining how it approaches and depicts the battlefields in World War One. 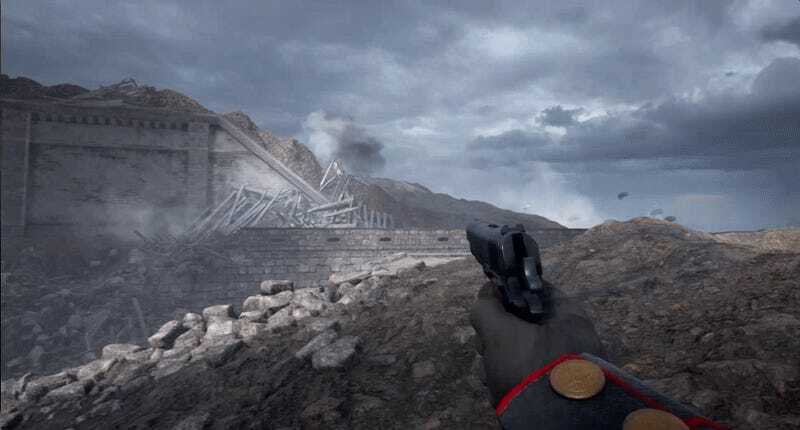 In the depiction of Verdun, the game seeks to stress the sheer amount of destruction present. To delineate it from other maps like those used in the Kaiserschlacht operation, the game employs a different color palette. It eschews the drab grays and muddy browns in exchange for a hot red glow. Stylistically, it does a good job of conveying a unique feeling of encroaching death and destruction. It’s clear that the game wants to impress the raw horror of the battle to players. But the other half of that coin is that Battlefield 1's attention to fidelity and mood also turns it into a type of exhibitionist work. While it offers potential education for the curious, it also functions as digital disaster tourism as well. Players are whisked to distance battles of the past to see the slaughter and devastation. This tension has always been at the core of the multiplayer. For myself, it remains irreconcilable with the single player campaign. For my colleague Kirk, the confusion of multiplayer battles held emotional resonance. The game’s look at Fort Vaux is much more intimate. Very little time is spent outside the fort; it is mostly a matter of close range combat in tight corridors. In many ways, it feels like Battlefield 3's Metro or Battlefield 4's Operation Locker. It makes sense. The forts were desperately held defensive positions. Fort Vaux was attacked by the Germans on June 2nd and proved a more difficult target to capture than Douaumont, which was basically captured overnight in February when the Battle of Verdun began. Major Sylvain-Eugene Raynal and a garrison of French soldiers held off the German assault for some time but they were eventually forced to surrender on June 7th. 2,740 German soldiers were killed or wounded in the fighting; only 163 French soldiers were killed. Fort De Vaux is a fantastic Rush map. The tight spaces and choke points are perfect for the assault class and battles can reach a fevered pitch. Its confusing and disorienting but feels fitting given the history. The majority of the fighting was done underground after the top of the fort was occupied by the Germans. Fort De Vaux visual design is less exciting than Verdun Heights but its interesting to see how much the gameplay overlaps with the intense history. They Shall Not Pass offers an interesting take on Verdun, eschewing the design of previous maps for something much more distinct visually and stark in gameplay. Verdun Heights and Fort De Vaux are fine additions to the game with a stunning history behind them worth remembering.